A couple of weeks ago we had a great A-level day with students from Altrincham Grammar School. Louise Sutherland (from the learning team) and I met the group of students at about 10 and we went up to the Life Lab for the workshops. We began with the drawing fossils workshop, concentrating on bivalves, brachiopods and trilobites. The beauty of running this session in the museum is that we use complete fossils from the collection that really help with the drawings. After this I showed them some of the more spectacular trilobites from the collection and we went on to the next activity: reconstructing fossil enviroments. 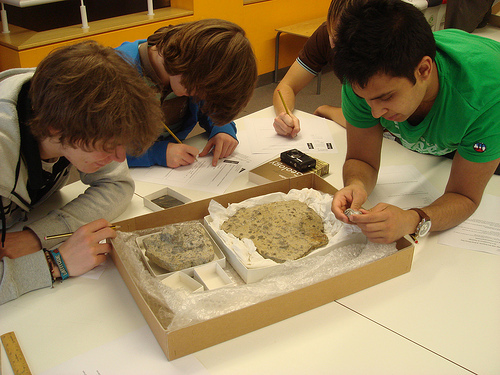 The students were given a mystery box of fossils and asked to interpret the environment and deduce the age. The students did really well and by the end of the session were able to sum up their findings using fossils and range charts. 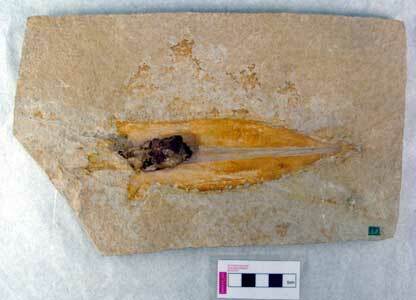 We then looked at more spectacular fossils from the Solnhofen Limestone and some amber. After lunch, we went on a tour of the stores and did the new dinosaur footprints workshop. The workshop uses amazing footprint fossils from the collection and asks the students to interpret a simulated trackway. This was done through measuring stride and foot lengths and calculating height and speed. 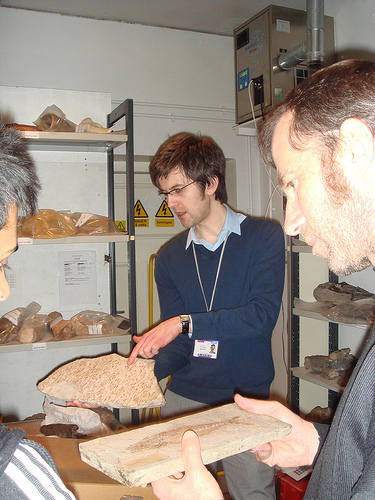 The workshops and tours seemed to go down a storm and the evaluation showed it was an exciting and useful introdouction to fossils at A-level. If you would like to book a workshop, please go to the post 16 page. Join us at The Manchester Museum this Saturday to celebrate Charles Darwin’s 201st birthday. Darwin’s theory of evolution by natural selection, transformed the way we understand the natural world. We are celebrating his birthday with a range of activities and tours for all ages. Experts will be on hand to talk about Darwin’s ideas and show objects from the collection, including things that Darwin collected himself on the voyage of the Beagle! This is also a fantastic opportunity to take a guided tour of the Darwin exhibition. I’ll be on hand with an amazing selection of fossils from the Solnhofen limestone, where the famous Archaeopteryx was discovered, just a few years after Darwin’s book ‘On the origin of species’ was published. Curators and collections staff make a massive contribution to life long learning here at the museum, be we don’t often tell people about it and the impact it has on people’s lives. We help the museum come alive for everyone from small children to older people.